A senior US Congressman who is highly critical of the Afghan government has been prevented from entering the country, Afghan officials say. Officials told the BBC that Dana Rohrabacher had been refused a visa and was prevented from boarding a flight to Afghanistan from Dubai. He has criticised alleged government corruption and Afghan officials accuse him of undermining national unity. Analysts say the incident highlights the volatility of US-Afghan relations. The BBC's Bilal Sarwary in Kabul says this comes at a particularly sensitive time, ahead of a summit in Chicago next month on the future of the country. The Congressman was stopped in Dubai on Friday as he was leading a delegation to Kabul. 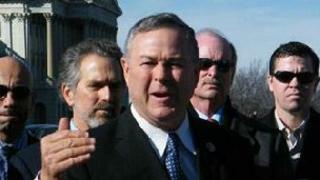 Officials say that while the other members of the delegation had visas for Afghanistan, Mr Rohrabacher did not. US Secretary of State Hillary Clinton was reported to have conveyed a message from President Karzai to the congressman that he would not be welcome in the country. Mr Rohrabacher, who is also the chairman of the House foreign affairs subcommittee, has frequently called for a more decentralised form of government for Afghanistan as well as a US investigation into alleged government corruption. Afghan officials told the BBC that in addition to his criticisms of the president, Mr Rohrabacher was being shunned because of meetings he had held in Berlin with Afghan politicians about the creation of a decentralised form of government. According to our correspondent, Afghan officials view that as tantamount to interference in the country's internal affairs. "Anyone who speaks against the good of Afghanistan and tries to interfere in our internal affairs is ineligible for an Afghan visa," one official told our correspondent. The US embassy in Kabul has been quick to distance the US government from Mr Rohrabacher, whose involvement in Afghanistan goes back to the 1980s during the Soviet invasion of Afghanistan, our correspondent reports. At the time he often accompanied mujahideen forces fighting the Russians. On Sunday US and Afghan negotiators finalised a partnership agreement for the US role in Afghanistan after its forces withdraw at the end of 2014. The draft agreement on their long-term relationship was signed in Kabul after months of talks. No details were released, with the deal to be reviewed by both presidents.